← Who Taught You About Respect? 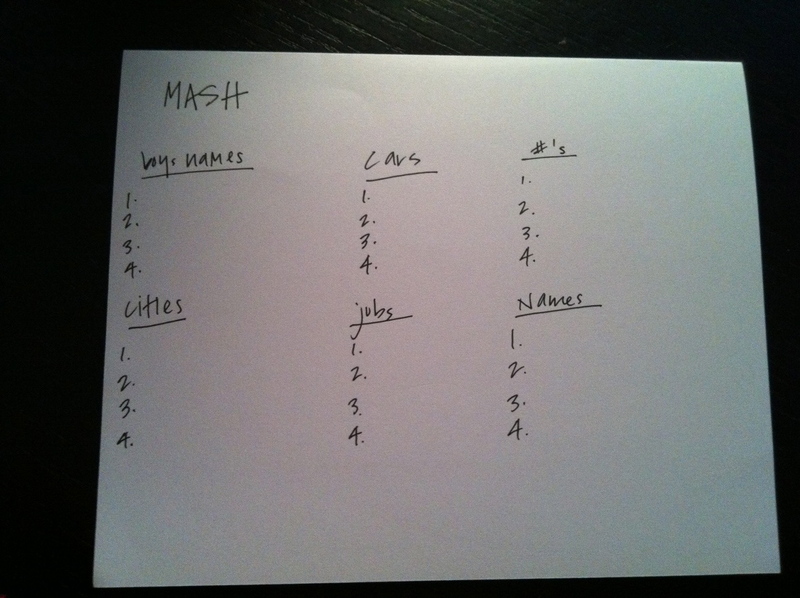 Do you remember as a kid playing MASH (Mansion/Apartment/Shack/House)? It used to be a horoscope/8-ball into your future. As a girl (and I can imagine more girls than boys played this game), you would list out 4 boys names, 4 cars, 4 numbers (usually meant for # of kids), 4 cities, and 4 jobs. Then the friend asking you the questions would say “Go” and they would make draw lines until you said “Stop.” Then they would count the number of lines and use that to go through the list and cross off items in each list until there was only one left. I have not played that game in years and years. AND. Yes, there is an online version. No longer do kids (if they still play this game) write on notebook paper. There is also, yes you guessed it, a MASH app. It came to me today because we have been house hunting and it made me think about the house I grew up in, and how much my parents paid for that house, and how expensive homes are today. Like dominos, my mind went from the house I grew up in, to my neighborhood, to childhood friends, to games we played and then to MASH. Does your mind do that kind of domino effect of one thing to another? As I started writing this post, I remembered I had this article saved for a while from LearnVest about “How much my lifestyle will cost?” I had been meaning to use their MASH style calculator that tells you how much money you need to be saving to have that MASH-esque lifestyle. It is sort of like a dream calculator. Ah…the things we did as kids. The dreams we had for our mansion, the boys we dreamed about growing old with, the luxury car, oh the list goes on. In the end, it all turned out all right. Dreams are good though. Some we meet, some we never attain, and some we blow out of the water!